This is an exact reproduction of the “folding handle frying pan” that was used by the trappers and “mountain men” in the late 17 and 1800’s. Perfect for camping meals when your trying to keep your cooking gear to a minimum or fits neatly in your haversack if you would like to recreate the experience of “times gone” for those “trekking” excursions. The handle folds up into the main part of the pan and slip into your haversack or backpack. 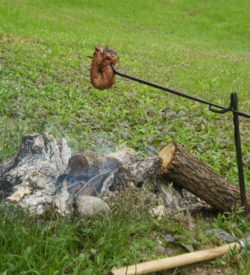 When you get to camp, find a suitable stick slip into that handle to extend your reach over the fire and you’re ready to fry up your bacon and eggs, johnnycakes, hamburger or squirrel. 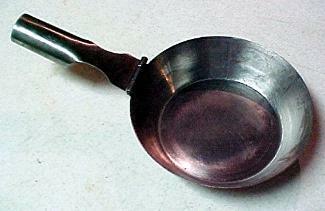 This is the frying pan many use during our “Survival 201” class. The frying pan weighs 7 1/8 ounces, is made of steel (just like the originals), and measures 6 1/2 inches when folded (just like the originals).